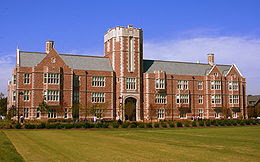 Washington University in St. Louis is a nonsectarian, private research university located in Greater St. Louis, Missouri. Founded in 1853 and named for George Washington, the university has students and faculty from all fifty U.S. states and more than one hundred and twenty five nations. Twenty-two Nobel laureates have been associated with Washington University, nine doing the major part of their pioneering research at the university.Washington University is made up of seven graduate and undergraduate schools that encompass a broad range of academic fields. 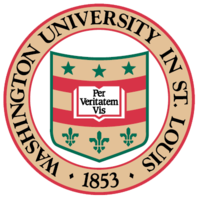 Officially incorporated as The Washington University, popular nicknames for the university include Wash. U. and WUSTL, all derived from the initials of the university's name. 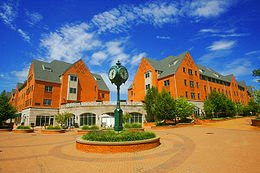 To prevent confusion over its location, the Board of Trustees added the phrase "in St. Louis" in 1976. The university has an endowment of $4.05 billion.The current chancellor is Mark S. Wrighton, who has led the university since 1995. He is among the highest paid university heads in the United States. 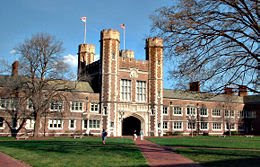 Washington University's origins were in seventeen St. Louis business, political, and religious leaders concerned by the lack of institutions of higher learning in the Midwest. The effort to found the university was spearheaded by Missouri State Senator Wayman Crow, and Unitarian minster William Greenleaf Eliot, grandfather of the Nobel Prize laureate poet T. S. Eliot. 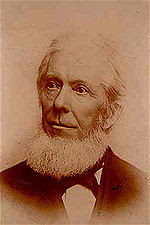 Its first chancellor was Joseph Gibson Hoyt. Crow secured the university charter from the Missouri State Legislature in 1853 and handled further political maneuvering. While Eliot was in charge of raising funds for the university, he accepted the position as President of the Board of Trustees. Early on Eliot was able to solicit some support from the local business community, including John O'Fallon, one of the wealthiest people in St. Louis, even briefly considering naming the university the O'Fallon Institute. However, Eliot failed in securing a permanent endowment. In fact Wash U is unique among other American universities, in not having any prior financial endowment to begin with; the school had no religious backing, wealthy patron, or government support. Therefore financial problems plagued the university for several decades after its founding. Washington University spent its first half century in downtown St. Louis bound by Washington Ave., Lucas Place, and Locust Street. By the 1890s, due to the dramatic expansion of the Manual School, and a new benefactor in Robert Brookings, the University began to move west. The university Board of Directors began a process to find suitable ground, and hired the architecture firm Olmsted, Olmsted & Eliot of Boston. A committee of Robert S. Brookings, Henry Ware Eliot, and William Huse found a site of 103 acres (0.42 km2) just beyond Forest Park, located west of the city limits in St. Louis County. 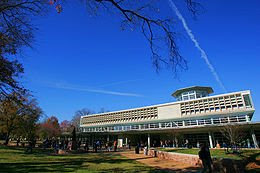 The elevation of the land was thought to resemble the Acropolis and inspired the nickname of "Hilltop" campus, renamed the Danforth campus in 2006 to honor former chancellor William "Bill" H. Danforth. In 1899 the university opened a design contest for the new campus. A plan for a row of quadrangles, submitted by Cope & Stewardson Philadelphia, won unanimously. 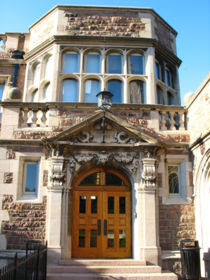 The cornerstone of the first building, Busch Hall, was laid on October 20, 1900. The school delayed occupying Busch Hall until 1905 to accommodate the 1904 World's Fair and Olympics. The delay allowed the university to construct ten buildings instead of the seven originally planned.